Dr. Pat McCloughan of PMCA Economic Consulting is delighted to support Plan Ireland. He attended the business breakfast event hosted by the charity – ‘Coffee Conversations’ – at Fire Restaurant on Dublin’s Dawson Street on 16 June. The very well-attended event, sponsored by Jacob Fruitfield, featured Danuta Gray, whose current roles include Non-Executive Director of Aer Lingus and Non-Executive Chairperson of O2 Ireland, in conversation with Tom McEnaney, Business Columnist with the Irish Daily Mail. 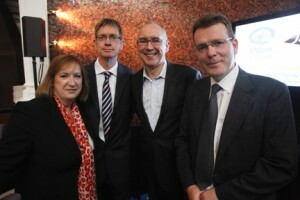 Pictured at the Plan Ireland Business Breakfast - 'Coffee Conversations' - are (L-R): Danuta Gray, businesswoman and former CEO of O2 Ireland; David Dalton, CEO of Plan Ireland; Tom McEnaney, Business Columnist with the Irish Daily Mail; and Dr. Pat McCloughan, Managing Director of PMCA Economic Consulting.